The guide to cheap web hosting reseller solutions and low cost reseller hosting services that provide some useful information about reseller web hosting providers and their reseller hosting programs as well as reviews of the cheapest reseller hosting plans and services. When we talk about reseller hosting, we usually mean so called bulk reseller hosting plans. They are usually large web hosting plans that are powered by special web hosting control panel that enables to divide that large reseller hosting account into smaller pieces and sell them to end users. So we buy web hosting services in bulk (and thus cheaper) and then sell smaller web hosting plans at a higher price to end users. A person who is going to start a web hosting business might want to try it first without making huge investments and even without establishing a company. In this case it might be a good idea to buy a hosting reseller plan that costs below $25 per month and get some experience in managing web hosting plans, servers and clients, providing customer support, and running and developing a web hosting company web site. When a person buys a web hosting reseller plan it does not mean at all that he/she should actually resell web hosting. If a web developer (webmaster) runs several web sites he/she can combine them all in one low cost reseller hosting account and thus (a) save money, (b) get more control over the web sites, (c) manage all the sites in one easy to use control panel, (d) get the ability to create unlimited web sites in a single reseller web hosting account, etc. A web designer can buy a bulk hosting reseller plan in order to offer his/her clients web hosting services. Thus a web designer gets (a) an additional and easy source of income, and (b) an ability to manage all his/her clients web sites easily in one single control panel without the need to remember multiple logins/passwords on different web hosts. HostGator is one of the most recommended web site hosting companies that specialises in providing low cost reseller hosting solutions that include not only reliable web hosting reseller plans but also some additional features like a free billing manager by whmautopilot, free merchant account, free optional web hosting templates to use for a hosting reseller site, and a free eNom domain reseller account that all togather allows the resellers to easily create and run a web hosting reseller business. All cheap hosting reseller plans provided by HostGator are powered by WHM/cPanel control panel and have the ability to host UNLIMITED web sites on a single, even on the cheapest reseller web hosting account. HostGator control panel supports many different languages, and has over 39 free scripts that can be installed instantly (Fantastico). CGI, PHP, Perl, SSI, Cron, FrontPage, Curl, GD, Image Magick, Chillisoft ASP, Shared SSL, etc. or check HostGator hosting reviews submitted by other visitors. HostGator reseller hosting accounts are powered by Web Host Manager / WHM control panel. Web Host Manager / WHM allows to create multiple single-site web hosting accounts for your web hosting customers or for your own use. After filling in few lines of account information and clicking "create", the new hosting account is instantly set and ready to go with its very own control panel called cPanel. Using cPanel end users (web hosting customers) can manage their web sites, create subdomains, email addresses, change passwords, check web site stats, install scripts, etc. without requiring any help. 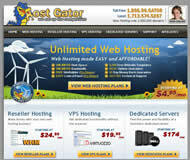 or read HostGator web hosting reviews submitted by their customers. HostGator provided an exclusive coupon code specially for the visitors of our web site. The coupon provides $10 discount ($9.94 discount) for any reseller hosting plan. The coupon provides First month FREE (actually, $0.01 per month) for HostGator Baby shared hosting plan and $9.94 off for any other Host Gator shared hosting plan. To get the coupon code please CLICK THIS special link to get to HostGator web site and take the coupon code, choose shared hosting, your desired domain name, and the package (Baby Plan); then submit a proper shared hosting coupon to the "Coupon Code:" text-box. Click 'Continue to Step 2' button, and see the coupon applied at the Step 2 page. or read Reviews of HostGator services added by other visitors.